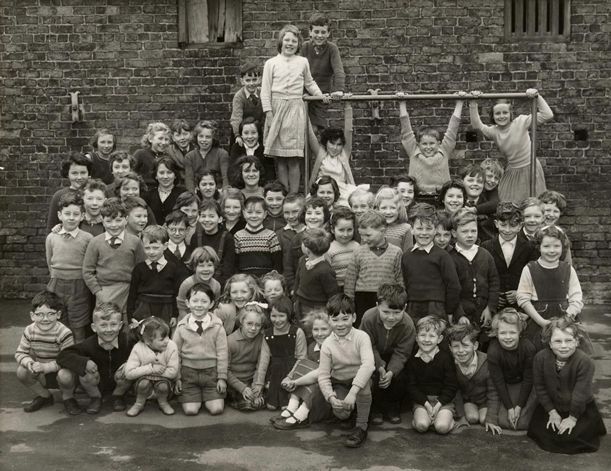 A picture of the pupils of Eastrington school, taken in the school playground in 1960. It was kindly loaned by Mr and Mrs Harry Wiles. A big thanks to the former Bernice Wraith and Jeanie Robinson, who have both emailed me and kindly identified many of the people on the photograph. More work has now been done by the former Linda Flint who, out of the 63 children on the photo, has identified nearly all of them, and help has also been received from the former Angela Wiles. If you can help with the unknowns or think we've still got it wrong, please get in touch. The children are not really in rows but I've tried to identify them as well as I can. Front row, from left: Peter Wraith, Ian Young, Carol Hopkinson, Jimmy Wraith, Linda Flint, Lynn Johnson, Anne Chapman, Colin Wraith, Herbert Lowther, Charlie Chapman, Stephen Clark, Pamela Atkinson, Susan Naylor. Second row, from left: Stephen Cammidge, Stuart Young, Andrew White, Tony Ingram, Robin Watson, John Benson, Maureen Wraith, Elaine Anson, Doris Crowcroft, unknown [turning round], May Lowther, Frank Johnson, Eddie Crowcroft, Susan Watson, John Railton, Albert Clark, Garry Westoby, Stephen Dent, Angela Wiles [with pinafore]. Fourth [back] row, from left: Valerie Johnson, Shirley Clark, Graham Harrison, Jackie Railton, Carmella Grande [with pigtails], Doreen Robinson, behind her Kathleen Malcolmson, Keith Holmes [behind Kathleen], Phyllis Brown [standing on bars], John Kirk, Mary Clark [hanging left from bar], Gladstone Lowther [hanging, middle], Jean Robinson, Keith Calvert, Freddie Harrison, Kathleen Gaskin.